KHATAMI INDICTED!... Vows Tape Showing "Impure Touching" Was Altered! KHATAMI INDICTED!… Vows Tape Showing "Impure Touching" Was Altered! He may deny it, but in his lustful heart he loved it! The sinful act of illicit touching by former Iranian President Sayyed Mohammad Khatami was caught on tape. YouTube Video HERE (17 seconds). Evidently, he loved it so much he had to indulge himself a second time just moments later! I hope it was worth it… I really hope it was worth it. Now, the so-called “moderate” who just lashed out against the enemies of Islam earlier today, is denying the charges even though it was caught on tape!! Iran’s former reformist president Mohammad Khatami on Thursday vehemently denied breaking Islamic rules by shaking hands with women on a trip to Italy, amid growing condemnation from conservatives. Khatami’s old hardline foes have expressed outrage over video footage circulating on the Internet which apparently shows the former president shaking hands with several women. “Khatami officially denied that he had shook hands with any woman and the film circulating is not based on reality,” said a statement from his office reported by the ISNA news agency and Ham Mihan newspaper. According to Islam’s sharia law, it is forbidden for a man to have any physical contact with a woman to whom he is not related. Whether at home or on trips abroad, Iran’s officials studiously avoid handshakes with females. Meanwhile… A lawsuit has been filed against the “political prostitute” Khatami for his sinful touching of a woman by theology students in Mashhad, Iran. An Iranian religious tribunal will try former president Mohammad Khatami, a moderate Muslim cleric, and possibly ban him from preaching over a handhsake with two women during a recent trip to Italy. The court, which is charged to rule on crimes committed by clerics, will examine the lawsuit presented by a group of talabeh, theology students, from Mashhad, Iran’s holiest city. Another lawsuit has also been filed by paramilitary militia Hezbollah, present in all major Iranian cities. 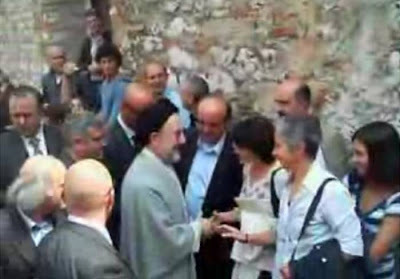 On 12 June, the Baran foundation of Khatami issued a statement denying the cleric had intentionally shaken hands with women – as shown in footage of his trip to Italy broadcast on ‘YouTube’ – a gesture prohibited under Iran’s strict interpretation of Islamic law banning all physical contact between men and women who are not related. The statement indicated either the footage had been edited to give a false impression or else Khatami had shaken the hands of people in a crowd without realising they were female. 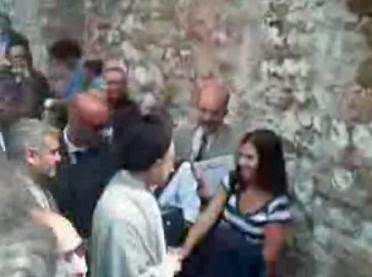 The footage shows the president speaking to and then exchanging a handshake with Gianola and Cristina Nonnino, well known local producers of grappa, or husk brandy.